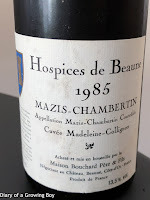 1985 Hospices de Beaune Mazis-Chambertin Cuvée Madeleine-Collignon par Bouchard - very smooth on the palate. Nose clearly of stewed fruits, but still somewhat alive. A hint of savory notes. Clearly past its prime but still drinkable.